The thump and the wail were loud enough that they brought Dad and me running from opposite directions. We arrived in the living room at the same time to see Boots red-faced and crying. “What happened here?” we asked simultaneously. His brother already was supplying that answer. “He HIT me!” Boots wailed in his “end of the world” way. Ay, but from 44 years’ experience, I knew there had to be more to it than that. 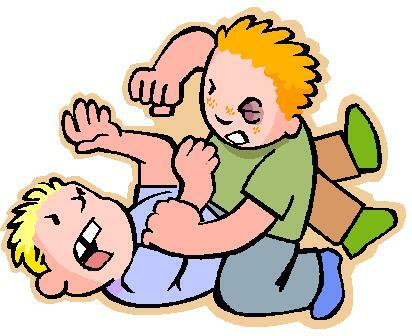 Unless the older sibling is Ted Bundy in training, rarely will he/she instigate an unprovoked battering. Boots has learned the younger-brother ways well. In a mere 18 months, he’s advanced from his first cross-tattle to full-blown provoke and pout. As an older sister and frequent victim of such shenanigans, I’m completely sympathetic to Big Guy’s plight. Dad, not so much until I told him the claw-hammer story, about how my brother maimed and I got the blame. I’ve warned Big Guy repeatedly: The one who hits — or screams or grabs — last be the one busted. Always. Yet, it’s not sinking in. Not even after he got in trouble at preschool about a year ago for a shoving match with another kid. His successful final push also succeeded in landing him in timeout. “But he pushed me first,” Big Guy complained when I picked him up that evening. The worst part of it is, Boots no doubt developed his system based on his early days, when he legitimately needed protection from Big Guy’s sometimes-thuggish ways. Ah-HA! If that older one gets caught, he’ll get in trouble and I’ll skate. Two years down the road, the match is much more even — Big Guy weighs only five more pounds than Boots, though he still has him by about six inches — but the habits remain. Boots was shocked last night when, instead of sending Big Guy to timeout, I sat down beside Big Guy and starting asking questions. By the time I was finished, Big Guy was just about begging for timeout, though. He hates in when I put him on the witness stand for cross-examination. What’s going on? Why did you hit him? How could you handle it better the next time? Another go-round of Battered Brother Syndrome this morning tells me it’s still not clicking. But at least Big Guy now can recite the list of things he should do instead of lashing out.